AS MEDICATION EXPERTS, pharmacists are the go-to source for questions about opioid dosing and safety. An initiative at Cone Health Internal Medicine Center in Greensboro, N.C., is capitalizing on this medication expertise by using pharmacists to educate medical residents about how to deliver safe and effective pain management. 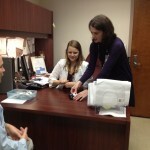 Kesly Combs, Pharm.D., and Jen Kim, Pharm.D, created a two-step opioid optimization initiative. An ASHP member since 2004, Dr. Kim, along with Kelsy Combs, Pharm.D., a former Cone Health pharmacy resident, developed the opioid optimization initiative shortly after the Centers for Disease Control and Prevention (CDC) issued opioid prescribing guidelines in 2016. 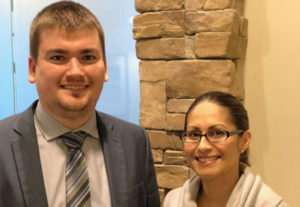 The duo believed pharmacists could make a significant impact on patient care by teaching medical residents about the opioid guidelines and other best practices for opioid stewardship. 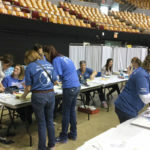 The opioid initiative created by Drs. Kim and Combs consists of two parts. First, the pharmacists evaluated the clinic’s population of patients who were receiving less than 30 morphine milligram equivalents (MMEs) per day and more than 90 MMEs per day. Patients with 31 to 89 MMEs per day were excluded due to a separate quality improvement initiative being implemented at the same time as this study. Patients with greater than 90 MMEs per day were chosen due to increased risk of overdose and the CDC’s recommendation to not increase past this threshold without careful evaluation of risk benefit, noted Dr. Combs. Patients with less than 30 MMEs per day were included because these patients were likely to be candidates for tapering/discontinuation of opioid therapy or optimization of non-opioid therapies, he added. They reviewed the patients’ medical records, calculated their MMEs, and looked for ways to fine-tune the patients’ overall pain treatment plans. 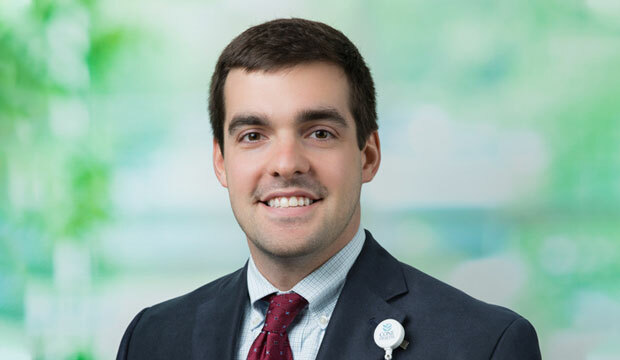 Dr. Combs, who is now an Ambulatory Care Clinical Pharmacist at Novant Health in Winston-Salem, issued treatment recommendations for each patient, including opioid tapering or use of non-opioid pain medications. “Drugs like duloxetine, pregabalin, and gabapentin are not always in the initial toolbox for treating chronic pain, even though they might be as effective as opioids,” explained Dr. Combs, an ASHP member since 2012. He noted that these medications are an important addition to the pain management armamentarium since some are also indicated for depression, a comorbidity that chronic pain patients sometimes have. “Choosing the right drug can mean treating both the pain and the depression while avoiding opioids and not adding another medication to the list,” said Dr. Combs. The second step of the opioid initiative involves teaching physicians about tapering doses and using non-opioid and over-the-counter (OTC) alternatives. The pharmacists provided medical residents with ongoing education and two one-hour lectures on pain management and opioid use. 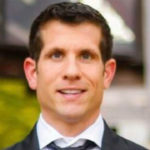 In a study examining the initiative’s effectiveness, Drs. Combs and Kim found provider education and pharmacist recommendations led to an average decrease of 11 MMEs per day among patients receiving less than 30 MMEs per day, and a reduction of 29 MMEs per day among those receiving more than 90 MMEs per day. The medical residents also significantly increased the number of prescriptions for naloxone kits during the study in order to ensure that patients using higher doses of opioids had the antidote available at home for their family to administer in case of an overdose. The plan to optimize opioid use was met with a very positive response. Physicians were eager for pharmacist recommendations partly because pharmacists and providers had “a strong interprofessional relationship,” according to Dr. Combs. An important part of physician education included the proper use of OTC medications. The pharmacists found that patients who had reportedly tried OTC analgesics may not have followed the appropriate dosing schedule or used the right amount. In some of these patients, a second attempt at using OTC medications at an appropriate dose and schedule made a big difference, Dr. Combs noted. “Something I emphasized to physicians is that they should really dig deep and find out the specifics of how a patient took a pain medication,” he added. One patient that Dr. Kim worked with was a 55-year-old female who had undergone knee arthroplasty. The patient had been prescribed a multimodal regimen including gabapentin, methocarbamol, naproxen, and diclofenac, along with a five-day supply of oxycodone/acetaminophen. “I educated her about the importance of minimizing the use of oxycodone and optimizing the use of non-opioids,” Dr. Kim recalled. Despite having a five-day supply of oxycodone, the patient stopped using it within three days of surgery and managed her pain with non-opioid medications alone. The initiative, which was a pilot project Dr. Combs implemented as part of his residency, was subsequently integrated into a broad ongoing quality initiative led by the clinic’s internal medicine physician residents. “I’m still involved by providing recommendations and teaching didactics within the physician residency program, but physician residents have taken on leadership,” explained Dr. Kim. Providers took what they learned and made several important changes to patient care in order to continue the reduction in opioid prescribing, she said. Physician residents now make sure patients undergo urine drug screenings and sign pain contracts, with the overall goal of reducing or eliminating opioid use. In July, the clinic started a medication-assisted treatment service for patients with opioid use disorder, where Dr. Kim assists with medication selection and access. Nick Gazda, Pharm.D., M.S., Assistant Director of Specialty Pharmacy at Cone Health, believes the initiative has had a lasting impact. “I think it has improved communication between pharmacists and other integral healthcare providers and increased awareness about the risks of opioid prescribing,” he said. Dr. Gazda has been a member of ASHP since 2012 and currently serves on the Section of Pharmacy Practice Advisory Group on Management of the Pharmacy Enterprise. Whether on the inpatient or outpatient end, efforts like these demonstrate what institutions across the country are finding out: Pharmacists can have a profound impact on safe opioid prescribing when they collaborate with other disciplines. “By building relationships with other care team members and getting everyone on the same page with our initiatives, we can greatly improve patient care,” said Dr. Gazda.